We saw that there is nothing objectionable about evolution in general, understood as the observation that species change over time and seem to be interrelated. I however expressed doubts about the mechanisms proposed as the drivers of evolution: they strike me as more closely related to some theories of economics or sociology that provide colorful narratives to explain events after they happen than to theories of physics that have predictive power. That does not make them bad theories, it just puts them in their place. We also discussed some of the merits and demerits of Intelligent Design theory. Today I want to point out some little known facts about the history of the idea of creation. We think of creationism as an old idea, and it is, but it is one that has undergone several changes down through the centuries. The modern notion of creation goes back to seventeenth and eighteenth century thinkers like Rene Descartes and Issac Newton. They conceived of creation as God designing the universe and putting it into motion the way a clocks-smith makes a clock, winds it up, and lets it run. They saw the universe as something like billiard table: hard little objects bouncing off one another in a closed system. A scientist is like a good pool player knows the size of the table, the mass of the balls, and the force applied to the pool cue, so he can always predict where the balls will end up. So Descartes, Newton, and their followers imagined God as a watchmaker or billiard player. You still find residue of this thinking in among the intelligent design crowd: they argue that since the universe is ordered, there must be an Organizer. If you find a pocket watch lying by the side of the road you assume someone made it; you do not assume it evolved. I’m not going to argue whether they are wrong, but I will point out that this argument is self-defeating in the long run. After all, what sort of God would design a Universe and then leave it lying by the side of the road? God, it seems, is an absent minded nerd. If you go back to thinkers like Bonaventure or Thomas Aquinas (13th century), or even Augustine of Hippo (4th century) you would find that the medieval notion of creation was, believe it or not, more sophisticated. They did not think creation could be proven. While they considered it a perfectly reasonable possibility that at the beginning of time God created the world, they thought it was equally possible that there was no beginning of time and the world was eternal. Creation as an event at the beginning of time was a considered a matter of faith. So they defined creation not as an historical event but as dependence of being. Since the universe is made of limited beings which flow in and out of existence, there had to be a higher, self-sufficient being that sustained them in existence. Its hard for us technical-minded moderns to grasp this idea. We see a watch and ask: who designed this watch? Then we see a tree and ask: I wonder if someone designed the tree? Medieval thinkers saw clocks and trees and asked: Why clocks and trees, and why not nothing? Since every individual thing in the universe could just as easily exist or not exist, then the whole thing could just as easily not exist. So they saw God as self-sufficient Being-In-Itself, the fullness of the possibilities of existence, who sustains limited beings in their existence. So whether or not there was a first moment of creation becomes almost irrelevant to someone like Aquinas; what interests him is not why a certain being is this way or that, but why beings exist at all. Of course, this is not what we would call a “scientific” question, but a philosophical one. Right away we can see how the notion of God and the universe here is much more interesting than what Newton or ID theory would propose: rather than an absent minded engineer who designs the universe and then wanders away, the medieval version of God actively sustains the universe by his thought and desire, without which the universe would dissolve into nothing. This is what they meant when they spoke about “creation”. This work of creation transcends human experience: it is a mystery of faith. I’m not sure how this sort of a vision of the world could translate into today’s mentality. The medieval mind had a much more static vision of nature than we have, what with our big bangs and expanding universes and all. On the other hand, they had a more dynamic view of what an individual being is: “being” is a richness, a vibrating actuality derived from God, not an inert collection of parts put into motion from the outside, as Descartes or Newton would have it. They might have liked the idea of the universe and life developing over the eons by the force of some inner dynamism. Marduk makes the earth out of his great-grandmother. Bible scholars point out that there are three accounts of creation in the Bible (two in Genesis and one in Wisdom) and they do not agree much in the details. 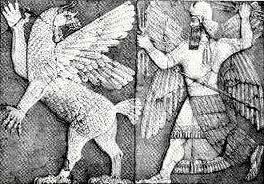 They also like to point out the similarities between the first chapter of Genesis and the older Babylonian creation myth, the Enuma Elish. Just reading the first few lines you get the idea that whoever wrote Genesis 1 had already heard the Babylonian story. But that means the author of Genesis 1 was aware of how his version was different, like he were trying to prove a point. The Enuma Elish recounts a war between the gods. The toughest god, Marduk, fashions the world from the dismembered corpse of his dear grandma, whom he had killed when she tried to eat him. He then makes man as a slave, because the gods were sick of working. You can imagine some Hebrew priest around 1000 BC reading the Enuma Elish and thinking “Gross! It wasn’t like that at all!” So he sits and writes his version in which God creates not with his own hands, but by his mysterious word “Let there be light!”, and not as the result of war, but because “it was good”, and creates man to be a co-worker in paradise, not a slave. He had the same scientific vision of the world as the author of the Enuma Elish (waters above and waters below, formation of land masses, etc) but he gives it a completely different meaning. So here are two competing narratives about where the world comes from and what it all means. Sound familiar? Is the world a product of chaos or a product of order? Of competition for survival, or of a free gift? What comes first, knowledge and love, or darkness and decline? Given the scientific evidence available to us, we still have to choose the meaning we give it. This came up in your ‘Related’ posts from your most recent. Interesting read.